If you've started to follow me on Instagram, you might have noticed the copious amount of pictures I've taken featuring my new Charlotte Olympia "Abstract Kitty" flats. To be honest, they are just too cute not to take pictures of, and staying true to my style, they are definitely a fine example of fashion as art. In fact, the "fashion as art" aesthetic was taken quite literally by Charlotte Olympia because in creating these wonderful velvet slippers she directly references the work of Wassily Kandinsky, a Russian painter who is credited for creating the first purely abstract painting. These shoes are definitely "purrly" abstract! I wasn't quite sure what to wear for the "maiden voyage" of these shoes. Sure, jeans would obviously look great, but I wanted to opt for something a little more special. After much deliberation, I decided on this houndstooth skirt that I picked up at the end of summer from Forever 21. I wasn't sure if I could pair hounds with kitties, but they seemed to get along just fine! I love quirky shoes, and I have started to amass quite a collection of shoes (and also bags) that are either in the form of animals or different objects. I guess it's the fashion equivalent of programmatic architecture, where buildings are designed to look like specific things, such as the Bulldog Cafe that's in the shape of a bulldog or the iconic Randy's Donuts that's the shape of an enticing donut. I like that type of architecture because it's so kitschy and offbeat, so why wouldn't I like shoes with a similar aesthetic? 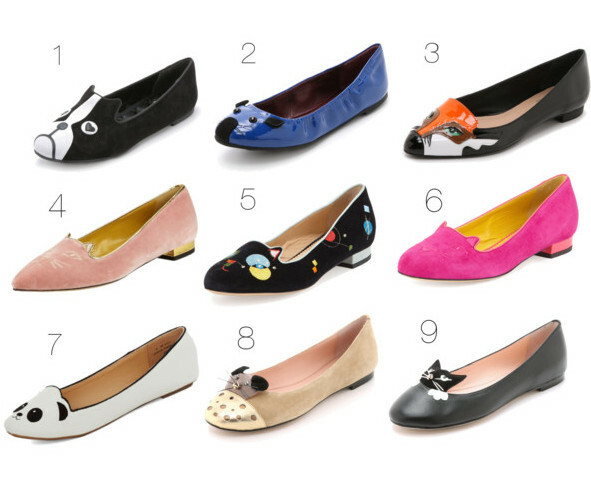 Below you will find some of my picks for other "critter" flats that feature a vast array of animals. I tried to encompass as much of the animal kingdom as I could, so you'll find everything from more kitties, to dogs, to pandas, and even some mice to occupy the kitties. Those shoes are purr-fection! (You know I couldn't help it!) Such a great purchase and a piece you'll have in your closet forever! 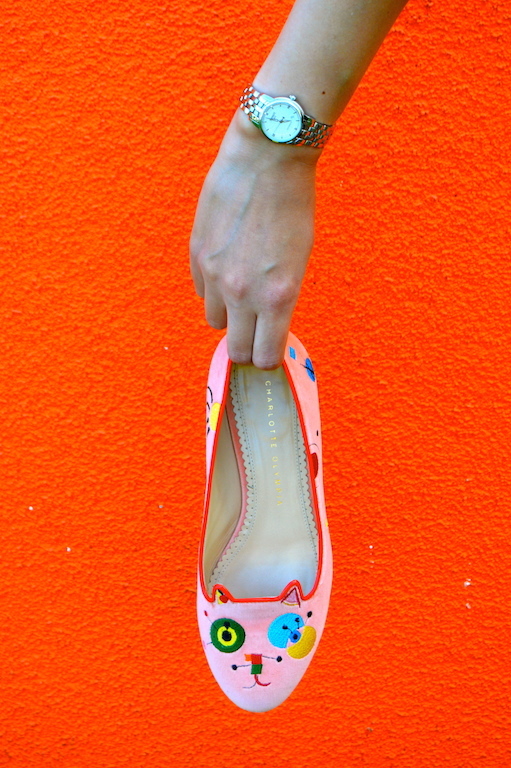 Your kitty flats are adorable, I would wear them all the time too. And I love all the other options you found, also. 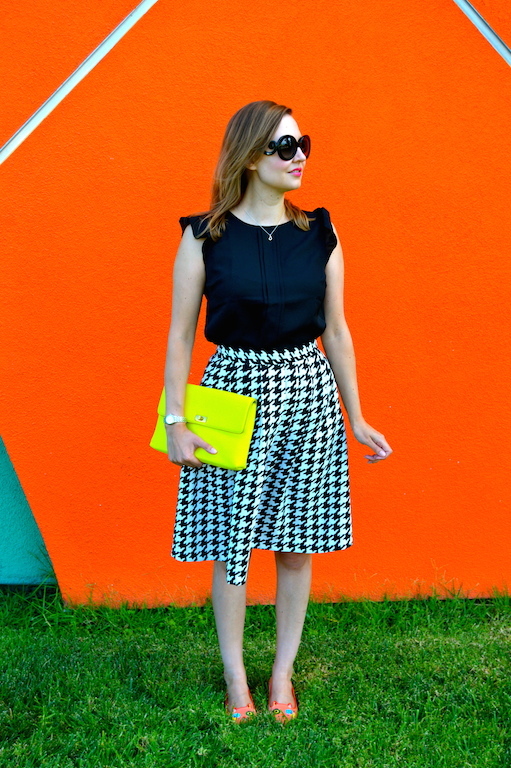 As a lover of houndstooth and midi circle skirts, I am in love with your skirt! Such fun, quirky shoes! Love your skirt and glasses, too! Great look! Those shoes are so fun! 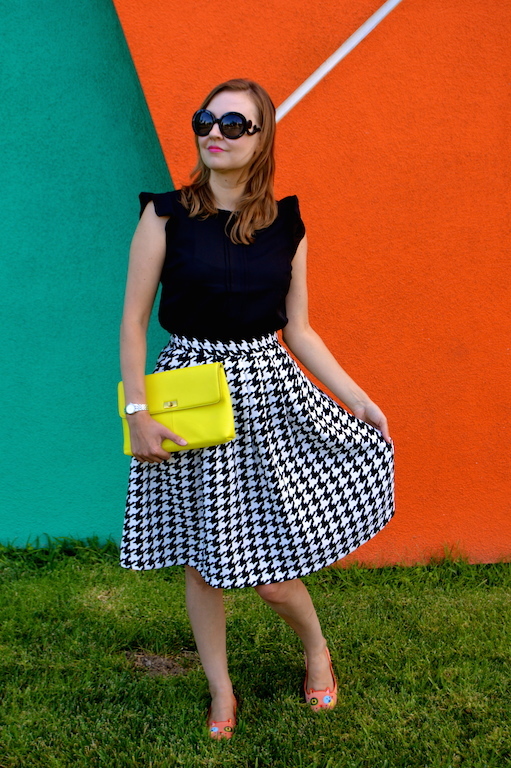 I'm loving your houndstooth skirt and that yellow clutch! Such cute girly shoes! 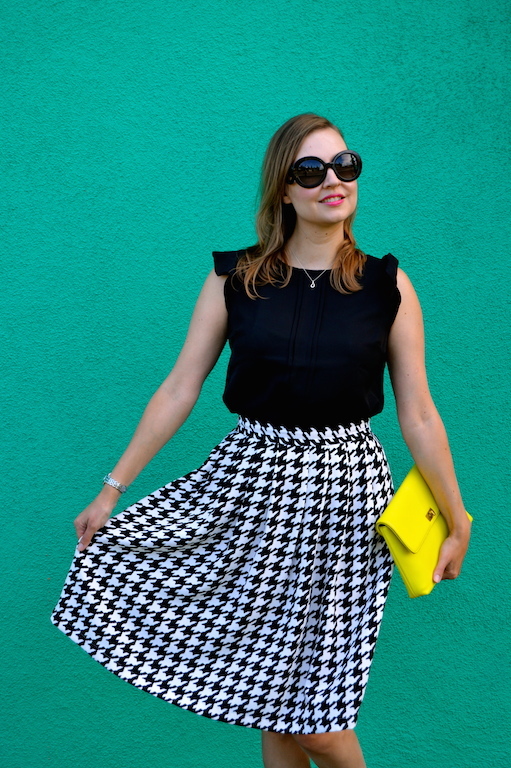 Your houndstooth skirt is really stunning on you and your sunnies are so classy. Your bright yellow clutch is so eye catching! I love your shoes! So quirky and cute! Your outfit is so pretty, too! those are the cutest flats ever! Classic and chic! Really lovely! Those are such cute shoes! Love them! I also like your outfit very much! 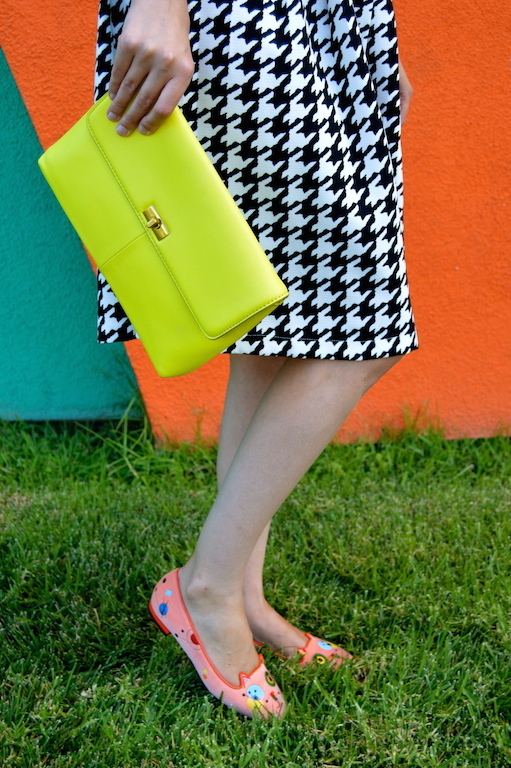 The yellow clutch makes this look perfect for the last days of summer. SO pretty!! LOVE the pops of color! Your pics are just gorgeous! I think these are the cutest and most artsy shoes i have seen in forever. I love your added Houndstooth, I can't wait to see how else you style it. The mouse and pink suede cat slippers are so cute! I love your houndstooth skirt here, very chic look! And, I've enjoyed following you on IG! I am allergic to cats but certainly not to these cute loafers! I adore this outfit wit the additional of great fun! 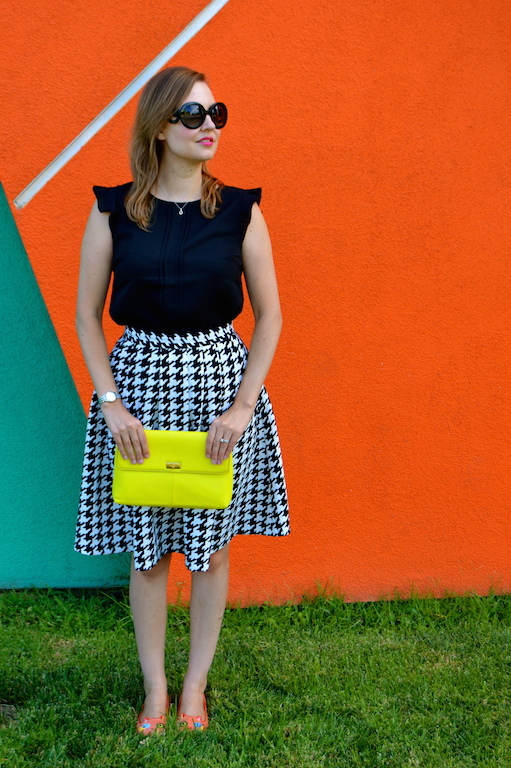 I am crazy about houndstooth ! Your skirt is marvellous I think that I will head out to F21 later today and see if I get lucky and they have this skirt.